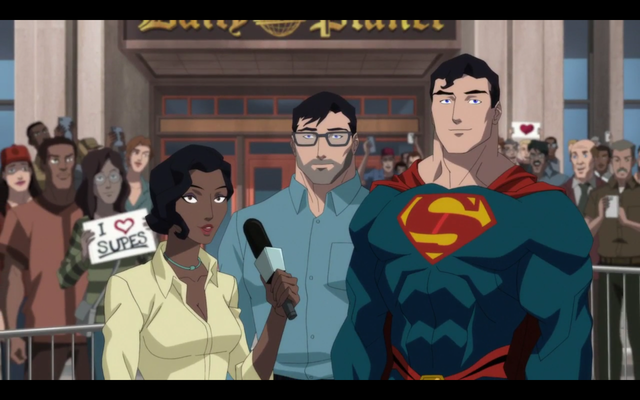 View Poll Results: What was your opinion of Reign of the Supermen animated movie? Good. A solid follow up. I thought it was a pretty solid movie but it definitely had some issues. I thought all the Supermen had a good showing. Steel was awesome (though they never mentioned his also being inspired by John Henry the steel driving man), Superboy was funny and charming, Eradicator was an emotionless force of destruction, and Cyborg Superman was a pretty intimidating villain. They had to crame two worlds together and it hurts the movie a bit. The filmmakers not only had to tell the story of Reign but they had to include the Justice League animated world that they have already created. I liked how they took the League off the table but I found the sequence a little silly as the team just happen to assemble in a clump for no reason. I loved seeing Lois and Diana form a bond. Superman using the Seinfeld worlds colliding reference was funny. Lots a nice little references and winks to the audience. Superboy using 90s slang from watching too many old sitcoms. Rain Wilson’s Lex has become one of my favorite interpretations of the character. A perfect mix of arrogant nerd, brilliant super villain, and all around jerk. His “Make Metropolis Safe Again” slogan made me laugh. One of my biggest complaints was that they used that god awful Darkseid design again. Easily the ugliest version of Darkseid ever. It’s like Thanos’ costume vomited all over him. Last edited by Robotman; 01-17-2019 at 05:09 PM. Good movie. Suffered from having to compact so much story into 83 minutes. Probably would've been better if we had gotten three movies, Death, Reign, and Return, but then we couldn't have had another Batman movie and DC wouldn't have stood for that. The breakout character was Kon who was fantastic. Steel and Eradicator were good but didn't have much to do unfortunately. We finally got the Black Suit Superman with a mullet and guns which is all I really wanted. We got the Reborn suit. All in all I'd give it a 8/10. I loved it. It was a great follow up to Death of Superman and did a pretty good job of adapting the storyline within the confines of a short film. It also works as a pretty solid transition away from the New 52 dependent continuity they were working with. Most importantly for me, it's probably the best version of Lois Lane we've seen in years. Really great showcase for her as a character and just an all around great performance. Add in the mullett, black suit, and then the Rebirth suit and it's a 9/10 from me. Is the Reborn suit at least a decent blue this time, or are they using that crazy-@$$ navy color from before? It’s lighter than the New 52 Suit was, you could probably see what it looks like on YouTube, I think there was a clip with it uploaded there. Definitely a solid movie. Once you realize that this will not be a one to one adaptation it can stand on it's own merits. I just wish this was a trilogy. Loved the Christopher Reeve-like fly by at the end. 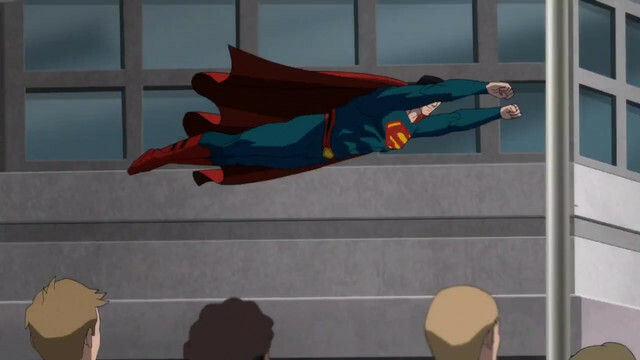 Also the air whooshing sound of Supes flying was reminiscent of the Steve Reeves Superman show. As for the after credits scene, Lex will no doubt be rejected by the League. The fact that he was wearing his Super Friends costume leads me to believe that he’ll form his own Legion of Doom or Injustice Gang as retaliation. I was a little confused about some aspect of Cyborg Superman. Was Henshaw actually on Apokolips and the Cyborg Superman just an avatar? Or was the Henshaw seen with Darkseid just an aspect of his psyche? They seemed to be in two places at once then suddenly the Henshaw on Apokolips was just gone. Also, Henshaw’s motivation for hating Superman was weak since he knew that Darkseid had sent Doomsday, which was the real cause of his wife’s death. Yeah Superman wasn’t there to save them but the actual person responsible was Darkseid. There was some insinuation that Darkseid had fed him the Ant-Life Equation, filling him with hate. But he still seemed to be cognizant of his actions. Last edited by Robotman; 01-18-2019 at 01:01 AM. Wow, they like their crappy muted colors, don't they? But it IS still a big improvement, so that's good. The Henshaw on Apokolips was a mental projection. The “real” Henshaw was Cyborg Superman. It confused me too but the ending where he’s in his human form and gets fried by Eradicator helped it click for me. Yeah, that was my interpretation as well. I do wish Henshaw had been an energy being, like the comics, so that he could have transferred himself elsewhere in the Watchtower and return in a future film. The way this played out, he seemed pretty dead. Btw I dont hate it,but i think they need to pick a suit to homage and stick with it,not trying to ape man of steel and reborn suit at the same time. I cracked up when Superboy did the action figure unboxing video. Now that I had time to digest it, I liked it alot more. Thinking about it, they hit alot of the story beats from the comics. In spite of the fact that we all knew what was going to happen, the story feels believable as a mystery. I love how Cyborg Superman sold himself as the real deal to the public by the end of the story, and did it saving the president like the comic. I also remember from the comics how the Eradicator seemed like the real deal at the fortress. I think there's plenty of opportunity for the Cyborg to come back too. I imagine he could be sitting somewhere in star labs catatonic waiting for another movie. . .
You mean at the Fortress of solitude.thats superman's crystal,eradicator in it,with a pretty damn convincing cybernetic type clone of him,that's a lot that if put in the wrong hands could cause a lot of trouble. I love that SB interacted with the JL,it made it "real"that he was apart if their DCAU. Green Lantern saying “I have the shot” as he aims a bazooka construct at Superboy cracked me up.